Let’s start with an exercise. Push away from this post for a minute, and do your best to either say aloud or write down your answer to the question – “What is the Gospel?” Make it as concise as you can possibly make it. John MacArthur’s emphasis centers hard and fast on the atonement theory of Penal Substitution, and elevates as primary, the idea that God treated Jesus on the cross just like he was a sinner, and treats us as if we had never sinned. It’s not hard to catch his focus on the doctrine of justification by faith through penal substitutionary atonement as the meaning of the gospel. Tim Keller’s emphasis (which begins with comments directed at those who preach in the public square), is — “Jesus Christ’s death and resurrection in my place” (@ 2:20-25). Ravis Zacharias’ emphasis is on existential emptiness and loneliness by virtue of alienation from God which is resolved by the work of Jesus, re-bridging relationship through forgiveness. Michael Horton’s emphasis in on the word euangellion as the announcement of victory after battle paired with the saving work of Jesus in extending eternal life, forgiveness of sin, and the crushing of evil. Sam Storms’ emphasis is the sinless life, atoning death, and subsequent resurrection of Jesus as a means by which forgiveness of sins is offered to those who repent of sin and respond with faith. You can continue scouring YouTube on your own for dozens and dozens more clips just like these. My central question in this post is — are all of these men saying the same thing when answering the question, “What is the Gospel?” From my perspective the answer is yes and no. There is emphasis in most of them on Jesus’ death, burial, and resurrection. However, interestingly, John MacArthur doesn’t refer in any way to the resurrection of Jesus in his emphatic insistence that 2 Cor. 5:21 is the “most Gospel centered text in the New Testament” (which makes me wonder if he forgot about 1 Cor. 15:1-8). Tim Keller gives the most succinct answer with very obvious allusions to 1 Cor. 15:3-4 (after responding to some imbalances often seen among street preachers in the first 2 minutes of his answer). Ravi Zacharias focuses on existential meaning and fulfillment through what Jesus has done. Michael Horton and Sam Storms are very similar, though Horton emphasizes the announcement of Victory through the work of Jesus, and Storms emphasizes the work of God in Jesus as the central idea in the Gospel (e.g. – God’s grace toward undeserving sinners). In every case the idea of the gospel being something that results in forgiveness of sin is very central. That’s it. That is Wright’s summary of the gospel (based on the writings of Paul in particular) in only 11 words. It was interesting to hear Michael Horton unpack the word euangellion as an announcement (another definition for the word) made by a messenger after a victorious war campaign. This can be set in contrast to MacArthur’s emphasis on penal substitution, and emphasizes Cristus Victor (Christ is victorious) as a primary lens for interpreting the meaning of the word Gospel (cf. Jn. 12:31, 1 Jn. 3:8, Heb. 2:14-15, 1 Cor. 15:25, Lk. 11:21-22, Col. 2:15, etc – as other really-really-really Gospel-centered texts in light of good news as a victory announcement). While there is no doubt that this word-picture is embedded in the way the ancient word was used (and does help to give the word Gospel a more robust meaning), there are illustrations that connect even better to what N.T. Wright is trying to say by centering the idea on the Lordship of Jesus after his crucifixion and resurrection. In Matthew, Jesus makes an unmistakable statement about he was thinking about it in the preamble to the Great Commission (cf. Mat. 28:18). For Jesus, the announcement that the disciples were to make was based on something dramatic that had happened after Jesus had been raised from the dead. Namely, that God had handed the whole world, including all authority to rule in heaven and earth, over to Jesus. The disciples were to announce that message of good news with every kind of person in the world, and call them to re-align their lives with that new reality. Wright, N.T. (2005) Paul in Fresh Perspective. SPCK, London (p. 57). Wright, T. (2004). Luke for Everyone (p. 307). London: Society for Promoting Christian Knowledge. Should every sermon contain the Gospel? Very good summation of the views. I also like Wright. He just makes sense. Thanks RJ!! Yep, N.T. Wright has a way of putting it all together. I haven’t finished reading The King Jesus Gospel, but I think Scot McKnight would say that the gospel is ‘The Kingship of Jesus’ – very much, I think inline with what Wright is saying here. They are both interpreting Jesus’ proclamation of the good news of the kingdom in light of the entirety of OT theology/message about God and His relation to humanity. For McKnight also “Jesus died for your sins, and therefore you should receive Him as your personal Lord & Savior” while a true and doctrinally sound statement, is not the gospel proclaimed by Jesus and apostles, esp. in the 4 gospels. (But since Scot is a regular reader of Think Theology now, I guess he’ll be chiming in anytime now – LOL)! Wright’s statement about Isaiah falls right in line with what Derek Morphew says (in his book Breakthrough) about the importance of Isaiah in understanding Kingdom Theology. I guess another way of saying it (perhaps more Pauline) is ‘the Lordship of Christ.’ As many NT scholars would say that the central thesis of the NT is that “Jesus is Lord.” And if Jesus is Lord, the Caesar isn’t. But now you’re stepping on my political toes, dude! ‘Cause I have had my heart set on a conservative political messiah who will set everything right in America (and therefore overflowing into the whole world), for a long time now! But I guess some could just as well substitute the word “liberal” and have it come out about the same. Where is our hope? Brad – I think McKnight’s book should be required reading for every Christian, and his thesis is exactly what Wright says about the Gospel. You can actually do better than his 11-word answer in his shorter answer, which is, “Jesus Christ is Lord.” THAT is the announcement of good news, and the answer to Israel’s questions, prayers, history, and every promise from Yahweh. God has been faithful to his people IN JESUS. I used to say the Gospel is “Jesus died for your sins.” I have radically changed it to “Jesus is Lord — follow Jesus.” That is both an announcement and an invitation. On the conservative Messiah idea, you should read my post – “A Pharisee’s Guide to the Death of Jesus”- where I try to discuss this very thing. It’s pretty obvious that early Jesus-followers were NOT getting beat up, stoned, chased out of cities, and crucified upside down for going around telling everyone how much God loved them, and how Jesus died for their sins so that they could go to heaven. No one will persecute you for talking about God’s love. Their message was (as they were accused) that Jesus was their King, and not Caesar. THAT will get you killed. Claiming to be a King was the charge written above Jesus at his crucifixion. So I agree with you, with McKnight, with N.T. Wright, and with (I think) early Christians. The Gospel is JESUS IS LORD – FOLLOW JESUS. Murka! For me, nothing is more important for us as Christians than following Jesus! Not our stand on abortion, not what programs/activities we choose to participate in at church, nor our views on the origin of humanity, etc. etc. etc. And quite frankly, I could almost care less that you have “accepted Jesus Christ as your personal Savior” if you’re not following Him (i.e. as Lord) – yes, its kind of a packaged deal! I disagree, respectfully. That isn’t THE gospel. God, please be merciful if I am wrong. Either Wright (and everyone who buys into his new perspective on Paul) is right OR tragically wrong. Why tragically? Because Paul makes it clear that anyone who preaches a gospel contrary to the one he has preached, should be accursed. In other words if you preach a different gospel than the Apostle Paul, you are going to hell. 1. 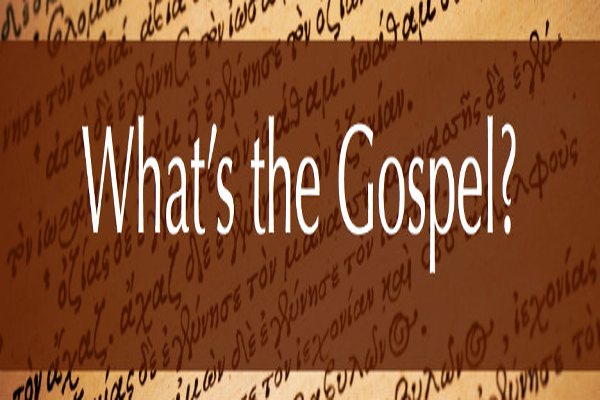 Question: What is the Gospel? Answer: The power of God for SALVATION to everyone who believes. 2. Question: What is contained IN the Gospel? Answer: The righteousness of God freely given and to be received through faith, by the perfect life, death, burial and resurrection of King Jesus. Wright’s “gospel” which is the imperial announcement that “Jesus is King, obey Jesus” is not good news to those of us who have spent our whole lives committing treason against King Jesus. I like Paul’s gospel much better. For Paul the very core of the gospel isn’t just the kingship of Jesus, but rather: Christ Crucified (1 Cor 2:2). He even nicknames it “The word of the cross” (1 Cor 1:18). The cross is the centerpiece of the gospel. Kenny you used to believe this (I have sermons from Galatians to prove it). Please come back to Calvary’s hill and let the Crucified Savior remind you of the good news that he died for your sins. He lived the perfect law keeping life, fully glorifying God in human flesh. He went to the cross to pay the penalty for you and I failing to glorify God. He was buried and then resurrected from the dead. This is the good news, amazing news, glorious news for us to confess, believe and be saved. This is our righteousness. This is the GOSPEL. I actually think you’ve reduced quite a bit of the “gospel” there. Additionally, not only have you reduced and neutered the “gospel,” you’ve overlooked a number of other crucial Pauline concepts that are deeply woven into the fabric of the NT’s teaching on the “gospel.” For example, where is emphasis on the promise of the Spirit? What about the mysterious Union with Christ that I think you hint at but fail to express adequately if one is going to take Paul seriously. It’s hard to imagine that you could draw out of Kenny’s post that he has left “Calvary’s hill” and has forgotten the “Crucified Savior” and his death on the cross for our sins. Is it possible you may have misunderstood Kenny’s point? To announce someone as LORD (which is what Jesus told his disciples they’d be doing in Mat. 28:19-20) and call them to obey him (which he also said to teach everyone to do) fits exactly with what we’re supposed to do with the Gospel once we understand it as God’s power to save. In other words – I believe Jesus – the crucified and risen Jesus is Lord of the World, and that my calling along with all the Jesus-follwers is to announce this to the world. Again, I don’t think Paul would consign me to hell or call me to the cross… Especially if I began with the two words… “The Crucified…” when describing the central emphasis of the good news.